Shop our super selection of men’s gold chains and men’s gold necklaces. 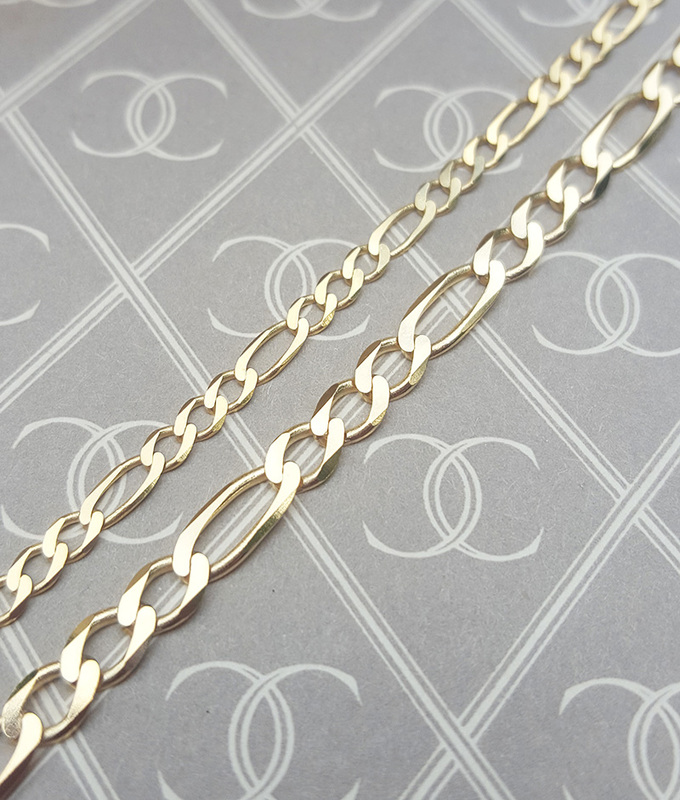 We stock men’s gold curb chains in a selection of widths and lengths, as well as men’s belcher chains, figaro chains, men’s gold rope necklaces and anchor necklaces. We also stock a selection of solid silver men’s curb, belcher, figaro and byzantine chains too. Hallmarked jewellery from Assay Assured jeweller. 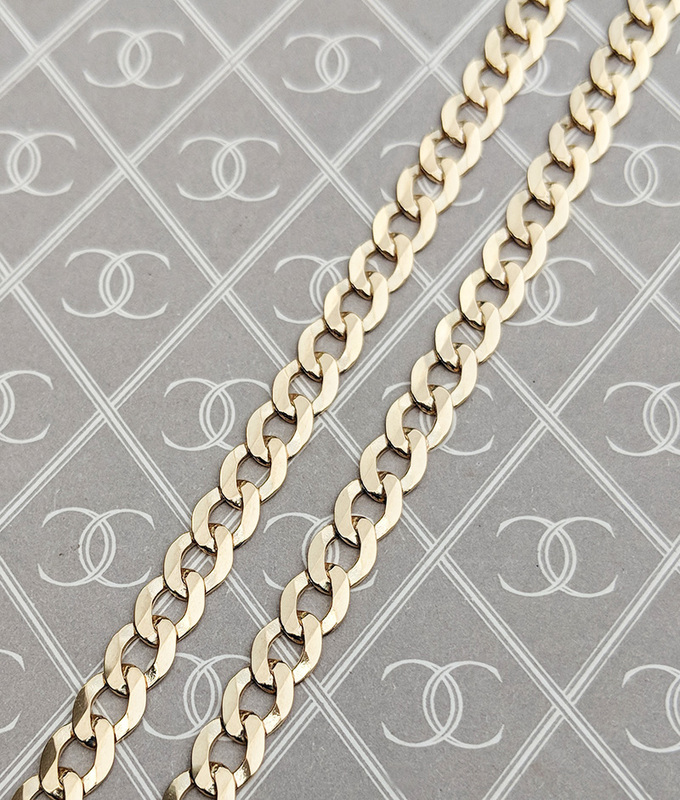 Our men's gold curb chains are all carefully crafted to exceptional standards in Italy. When they arrive in the UK, they are sent to the Assay Office for inspection and hallmarking. 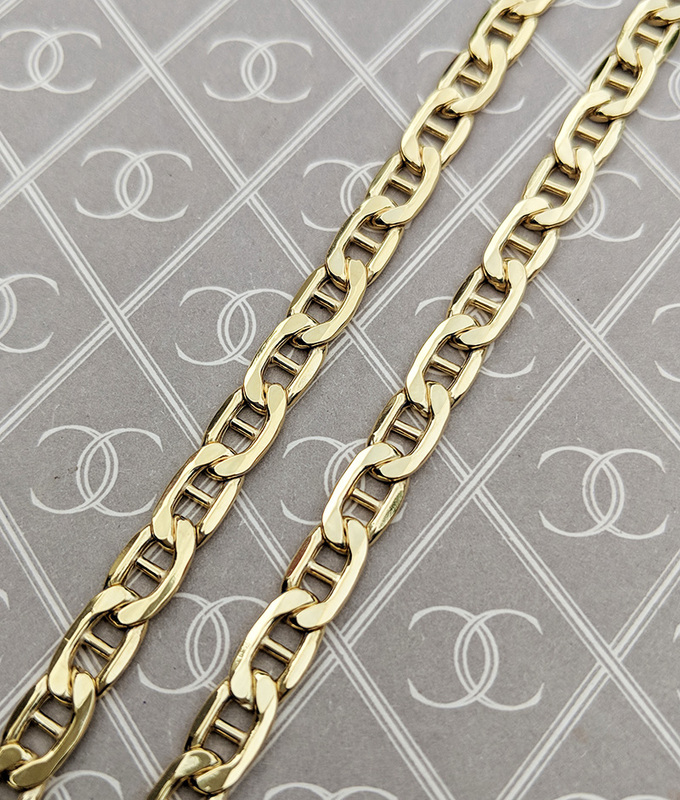 All of our men's gold curb chains carry UK hallmarks. Curb chains are classic in their style - beautiful and timeless. Choose a traditional flat curb, a thicker beveled curb, a close curb chain or a Cuban curb chain. All look super stylish and are available in a selection of widths and lengths. 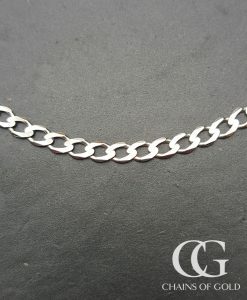 We stock discreet chains from which to hang that precious pendant, through to chunky, heavy statements men's curb chains for guys who like their jewellery to do the talking. 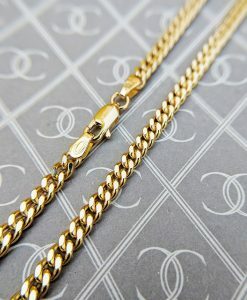 Gold chain lengths for men start at 20 inches, and we stock chains up to 30 inches. Most men prefer a chain somewhere in the 20-24 inch range. Belcher chains comprise of oval or round links. 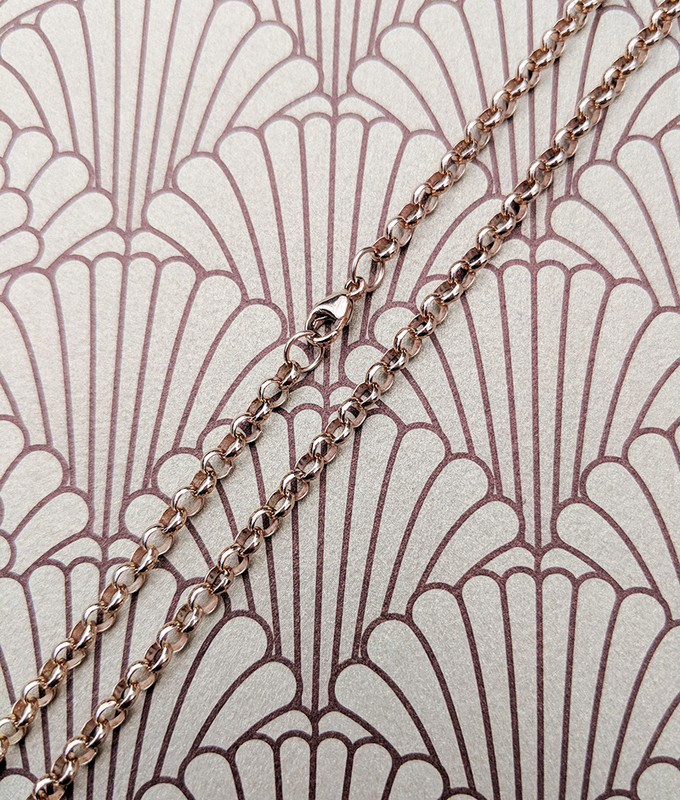 Sometimes referred to as 'rolo' chains, we source our men's gold belcher chains from Goldsmiths within the UK. 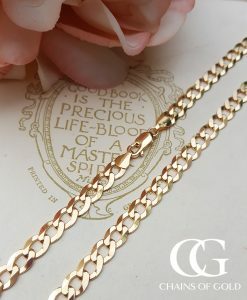 These solid gold chains are carefully machine made to exacting standards, and all carry UK hallmarks. 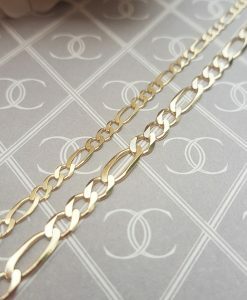 We stock yellow gold, rose gold and white gold men's belcher chains in lengths from 20 inches to 28 inches. These men's gold chains look great both as standalone necklaces, or teamed with a pendant. Rope chains have become incredibly fashionable for men in recent years, with chunky men's yellow gold rope chains particularly popular. Rope chains are decorative and eye-catching within themselves, with no need to adorn with a pendant or to team with other neck-wear. Being round and diamond cut, they reflect the light beautifully too. 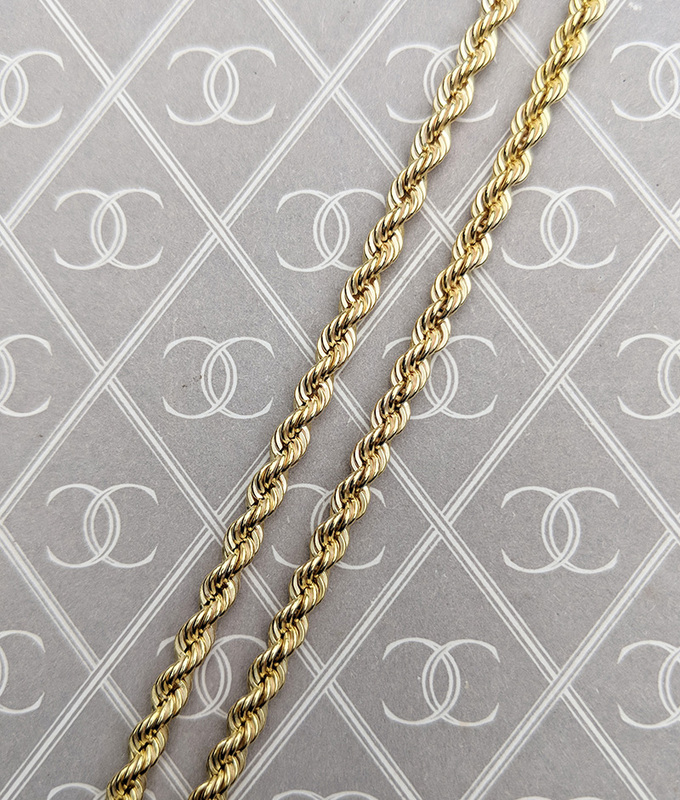 We stock men's gold rope chains in yellow, white and rose gold. 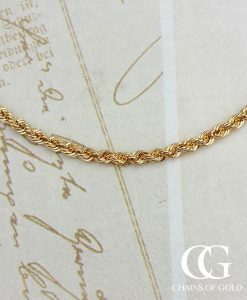 Fine gold rope chains and chunky gold rope chains are for sale in our UK based online jewellery shop. 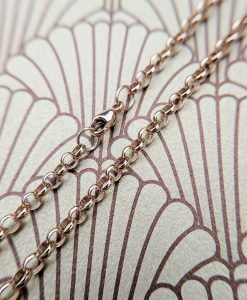 A traditional Italian-designed necklace, the men's Figaro gold chain features flattened links of alternating sizes - often one large followed by three small. 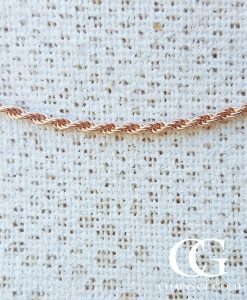 This uniformity makes the chain incredibly stylish and eye-catching, and consequently this men's gold chain looks great as a standalone necklace. 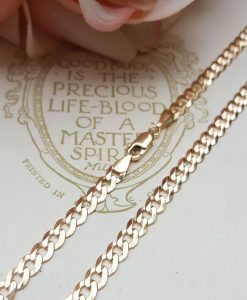 We stock men's solid gold Figaro chains in a variety of widths and lengths, and this beautiful chains is a popular purchase and a super gift for him. We love men's gold anchor chains here at Chains of Gold! They're unusual in how they look, and are sometimes referred to as 'rambo' or 'gucci' chains. Whatever you call them, they are attractively designed chains, distinctive and fashionable. The chain designs mirrors that found on a boat, attached to the anchor, hence the name. These men's gold chains make great statement pieces of neck wear and are definitely standalone items. Why Buy From Chains of Gold? A gold necklace in yellow, white or rose gold makes a super gift for him! All of our chains will arrive beautifully gift wrapped with a warranty and care card. Delivery is free worldwide, and UK based customers are able to return their gold chain for a full refund within 30 days. We are an Assay Assured online retailer and we are registered with the British Jewellers Association, so you can buy your men's gold chain with as much confidence as you would do from a jeweller on the high street.